Insurers, repairers and customers would do well to consult the Insurance Institute for Highway Safety’s criteria for evaluating vehicles and ensure collision repair decisions don’t countermand such safety features. Repairers are tasked with delivering the customer a vehicle that’s not only cosmetically identical but pre-loss from a crash protection standard. Auto insurers share the same responsibility, which makes it all the more absurd when cost-containment efforts or incompetence by one or either party undercut the safety of a vehicle winning IIHS Top Safety Pick or Safety Pick+ honors. The IIHS was founded by the insurance industry to encourage road safety; fewer crashes and related injuries benefit society and reduce insurer losses. Its mission has since expanded to evaluate how well models and incorporated technology (i.e. autobraking) protect occupants and keep repair costs down, publishing its findings for the benefit of consumers and actuaries. This offers a direct benefit for auto insurers, who must price risk correctly to ensure premiums aren’t too high to be competitive or too low that they risk being bankrupted by higher-than-expected losses. There’s also an indirect benefit: If customers buy safer cars with fewer crashes and injuries — and for the hat trick, also cost less to repair — insurers face a lower risk. A lousy safety rating penalizes an OEM in two ways: It hurts the brand (particularly when we can all watch an Epic Fail crash test on YouTube), and it raises the cost of ownership if actuaries conclude that the car means higher medical bills and raises premiums. And so, OEMs take IIHS ratings seriously; we’ve watched auto body engineers discuss their vehicles’ ability to pass the tests — particularly the tough 2012 small-overlap criteria — and automakers who fail to get a Top Safety Pick or Top Safety Pick+ will redesign and reinforce the vehicle as quickly as within a model year to make the cut. Repairers faced with an stubbon adjuster from any IIHS member insurer (including Top 4 State Farm, GEICO, Allstate and Progressive and many smaller carriers) should point out to this contradiction to customers and the carrier representatives. We’ll help. 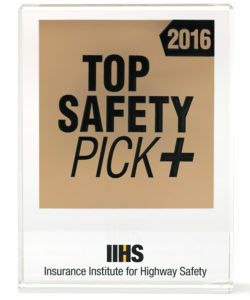 Here’s how to get a Top Safety Pick or Top Safety Pick+ (the highest honor), from the IIHS, and the kind of repairs necessary to restore some of the items. Check the repair procedures for the specific model in front of you, and help educate your customer and their carrier. Fail to follow OEM procedures designed and tested to restore this crashworthiness, and the repairer and insurer might undo all the automaker’s safety efforts. That opens up the risk of liability for the repairer and higher loss costs — particularly bodily injury — for an insurer during a subsequent collision. They’re also ripping off any mutual customer which bought the car or paid for options based on safety considerations. Finally, if the insurer is pricing risk correctly, they’ve already charged the customer for these safety and collision repair considerations and therefore shouldn’t be avoiding any legitimate ones specified by the OEMs. Just open a body repair manual. It’s not hard to see what kind of work could be necessary. “To determine crashworthiness, IIHS rates vehicles good, acceptable, marginal or poor, based on performance in five tests: moderate overlap front, small overlap front, side, roof strength and head restraints,” the IIHS states. These are all important tests, and repairers should review them all (or at least watch the videos) for a better sense of why OEMs have designed a car a certain way or require a certain repair procedure. For the sake of brevity, we’ll focus on the one that’s perhaps the toughest challenge for automaker engineers: the small-overlap crash test, a tricky simulation started in 2012 involving a car slamming into a narrow object at 40 mph. 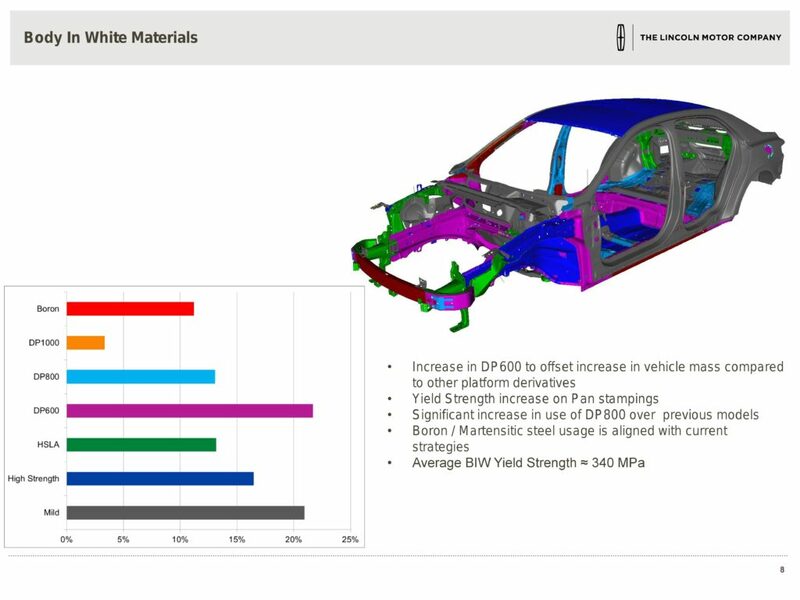 Passing this test relies in large part based on how OEMs design the body-in-white — particularly the front end and safety cage so commonly affected by any collision. Read the IIHS’ description and think about what this might mean in terms of parts and repairs. Small overlap frontal crashes primarily affect a vehicle’s outer edges, which aren’t well protected by the crush-zone structures. Crash forces go directly into the front wheel, suspension system and firewall. It is not uncommon for the wheel to be forced rearward into the footwell, contributing to even more intrusion in the occupant compartment and resulting in serious leg and foot injuries. To provide effective protection in small overlap crashes, the safety cage needs to resist crash forces that aren’t tempered by crush-zone structures. Widening these front-end structures also would help. For a look at another interesting Ford small-overlap collision management system, check out the 2016 Lincoln Continental D544 presentation from the 2016 Great Designs in Steel. The Fusion, MKZ and Continental are all derived from the CD4 platform, and what Jones described for the first two sounded similar to the Continental design (though Jones was unable to confirm that back in September). 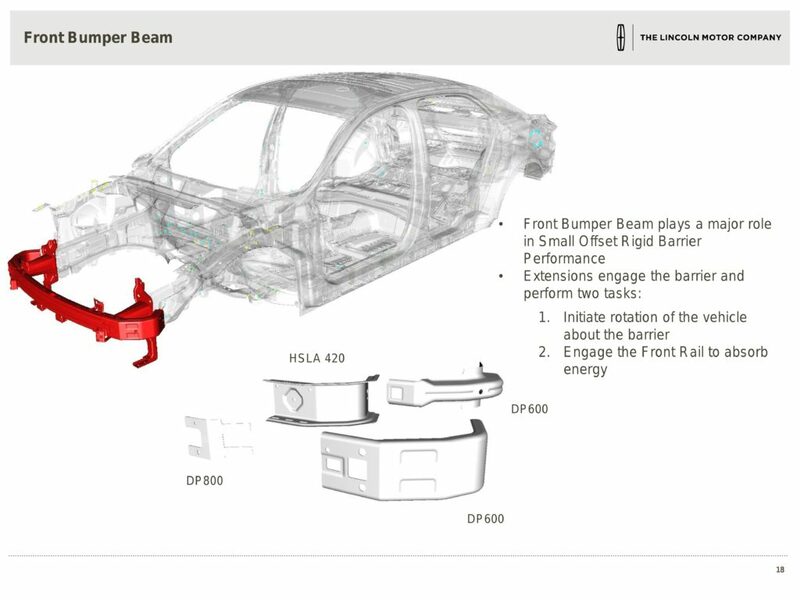 Ford technical leader and front-end/under-body applications manager Shawn Morgans said at the May steel conference that the brackets and extensions in the bumper beam system seen below were the true engineering stars in managing small-overlap crash energy on the new Continental. (The beam itself was made out of ultra-high-strength boron steel but otherwise was pretty much just the usual bumper beam, he said.) It seems likely that any part of this assembly failing to match the OEM design, steel grade or repair procedures could throw off the Continental’s small-overlap capabilities. The IIHS also has or plans to add evaluations for vehicles based on standard and optional safety features. This one will be a big deal for repairers, as one major reason OEMs flunking the 2016 exploratory testing was poor factory headlight aiming. That means if a body shop isn’t aiming headlights correctly — or at all — after a collision, they’ve just screwed over the customer who prior to the repair had a Top Safety Pick+. Another consideration would be how well aftermarket headlights would stack up to a new OEM version — which under IIHS testing actually gets a track test. Did overseas lamp imitators and certifiers test it like that, and if not, is it really pre-loss condition? OEMs have caught up with the small-overlap test, and they’ll likely start beating the headlight test consistently soon — will the aftermarket? There are many things that may make a calibration procedure necessary after a collision repair. A few events that may be cause for calibration include suspension or structural repairs, headlight replacement, or windshield replacement. Typical calibration procedures will involve a scan tool to aid in zeroing out angle sensors. There may also be the need for a target or other special tools. There are different conditions required depending on the vehicle. These conditions may include that the vehicle be level, that the area be dark, or that a certain amount of weight be placed in or on the vehicle. The IIHS has also concluded that automatic braking and even the lower-tech forward collision warning systems cut crashes, particularly when combined. Starting in 2013, an OEM had to offer “basic” (the lowest rating) front crash prevention of some form as an option to get a Top Safety Pick+. In 2015, that system had to net an “advanced” or “superior” rating. It is important to note that many vehicle makers require calibration/initialization of advanced safety systems and driver assist systems following part replacement, regardless of the extent of damage. If the repairs being performed include the replacement of sensors, wires, computers, etc. the OEM service information should be referenced to identify if calibration/initialization is required. Many of today’s advanced vehicle systems won’t illuminate a malfunction indicator lamp (MIL), even if there is a fault in the system. The only way to ensure that these systems are free from DTCs would be to perform some diagnostic checks. OEM position statements released in 2016 reiterate the mandatory nature of scans, though OEMs had already told repairers as much in repair procedures and other venues, and mechanics have been doing this for years. Either frontal crash prevention system, whether a simple or actual automatic braking, probably also requires calibration and more OEM parts to ensure the system continues to work in a “basic,” “advanced” or “superior” format worthy of the Top Safety Pick+. The auto glass industry is similarly affected by the technology — which frequently involves at least one camera behind the windshield — developing its own calibration methodology (though it’s unclear if it matches OEM repair calibration procedures) and faced with systems that require OEM glass; for example, Subaru’s EyeSight, according to I-CAR. Another good resource is I-CAR’s new calibration requirement database, announced earlier this month at SEMA. If you haven’t achieved certain levels of I-CAR recognition or training, you or your shop will have to subscribe or pay one-day use fees. But it beats an incomplete repair or a lawsuit should the autobraking or alert fail to trigger; the argument JN Phillips’ boss made in 2015 in Claims Journal about ADAS manufacturer liability would seem to apply to shops as well.